Now you can enjoy all the benefits of your Partnership Card, using Samsung Pay. It’s an easy, secure and private way to pay. Make quick payments with Samsung Pay using numerous apps and at thousands of locations, including Waitrose. Better still, when you add your Partnership Card you’ll continue to earn rewards on all your purchases. Download the Samsung Pay app. From big department stores to corner coffee shops, Samsung Pay is designed to make mobile payments simple and secure. You can spend above the £30 contactless limit, though this isn’t the case in all shops. To be sure, check the retailer’s policy. 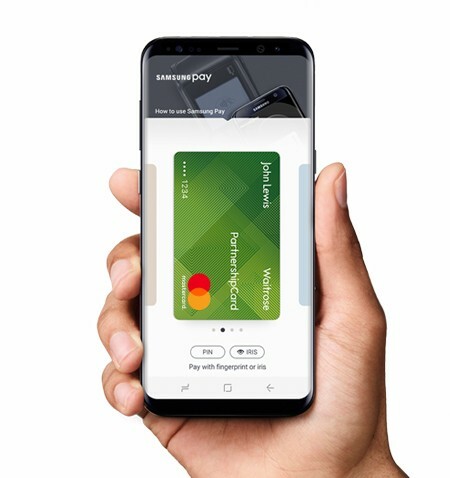 Samsung Pay is available with participating payment networks, banks and merchants and is only compatible with selected cards and Samsung devices. None of your personal or card information is stored on the device, so your details are safe. However, if your device goes missing you can use Samsung’s ‘Find My Mobile’ service to instantly lock or wipe the device from anywhere. Please also call us on 0800 015 0914, day or night, to alert us. If you’re abroad, call +44 121 214 5732. If you lose your actual Partnership Card, please notify us. You can continue to use Samsung Pay while we replace it. How do I set my Partnership Card as the favourite card on my device? You can set your Partnership Card as your favourite card by going to ‘Settings’, ‘Manage Favourite Cards’, and selecting your Partnership Card as your favourite. Note that the last card you used will automatically appear the next time you use Samsung Pay, unless you change your favourite. Can my additional cardholder add their Partnership Card to Samsung Pay? Yes. An additional cardholder can add their Partnership Card to Samsung Pay. Note that the security code for registration and the welcome email will be sent to the main cardholder’s email or phone. Will I still earn 1 point for each £1 I spend in Waitrose and John Lewis, if I pay using Samsung Pay? Yes. You'll still earn loyalty points at the same rate as you do now, 1 point for each £1 spent within John Lewis and Waitrose, 1 point for each £2 spent outside of the Partnership. Please note that John Lewis cannot yet accept Samsung Pay. Which devices are eligible for Samsung Pay? Here is a full list of eligible devices. Samsung and Samsung Pay are trademarks or registered trademarks of Samsung Electronics Co., Ltd. Use only in accordance with the law.